I am Teresa, Mum to three boys, wife to Carl, sling librarian and carrying consultant. CarryMoor was set up in 2013, my youngest was one, my oldest was two and my nearest sling resource was an hour away, a more local resource was needed, so here I am, CarryMoor. 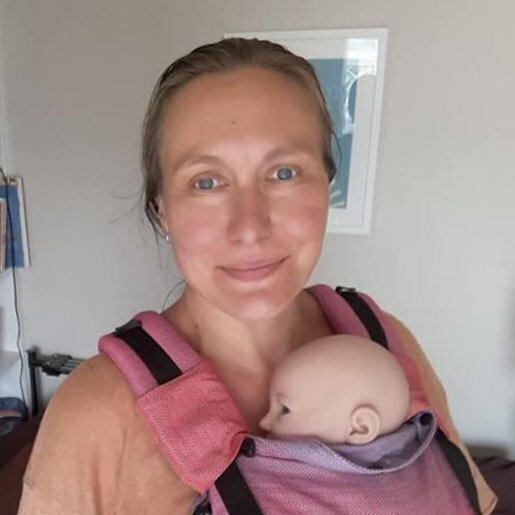 I have undertaken training with School of Babywearing, Born to Carry and Slingababy, and I continue to deepen my knowledge through personal development and official training with babywearing schools. On this website you will be able to find out when and where the drop-in sessions run, how to book a one to one, and what stock the library has available to hire. Visiting the library is easy. A weekly drop in service runs every Friday in Ilkley. Or if you prefer, you can visit the library at drop in sessions across the region. As a babywearing consultant it is my aim to help you find a carrier that suits you and your family. Consultations take place in your home and travel up to 30 minutes from Ilkley is included, if you are further away please get in touch. Have a look at the carriers and slings I have for hire in the library and check availability. Visiting the library is easy, there is a weekly drop-in service every Friday in Ilkley and I visit various locations across the region. Details of forthcoming drop-in sessions are shown below. Get in touch to try one out!